Whoever is responsible for sales revenue within the company is often seen as the Gandalf of the executive team. Nobody knows how they do it, but by working their mysterious magic the right numbers appear – with luck. But with potentially significant implications not just for revenue but also for costs, we should be expecting a much more rigorous approach to this vital company process than just berating the sales team until the numbers get bigger. Broadly speaking there are two types of revenue streams – volume products and fewer, high-value contracts. The volume business is all about managing numbers – getting enough into the sales funnel each month for the right number to drop out in two or three months’ time. With good historical data we should have a much better idea of what the right number is, what the conversion rate is likely to be and how long that should take. With a solid and consistent sales process outcomes are much more predictable, as are the effects of change. Much of this is also true for managing larger, discrete contracts. The difference is that individual deals are both identifiable and more complex. Forecasting can be reduced to multiplication of gut feel percentages through the reporting structure. While it is inevitable that at each stage of the sales process there will be a judgement call, with experience and a consistent process these values can reflect a considered validation of progress against a common sales approach. When opportunities are assessed this way it is much easier to be objective, and steadily more accurate, about forecasting. 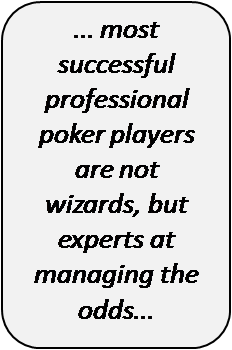 After all, even if we accept luck has to be allowed for in sales management, it is undoubtedly true that the most successful professional poker players are not wizards, but experts at managing the odds, coolly maximising their chances of winning by really understanding what is going on in the game and why.